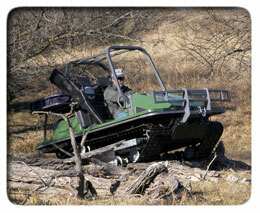 The RangeRunner provides transportation for a variety of recreational activities. Hunting, fishing and backwoods exploration, the RangeRunner will take you and your gear to locations inaccessible by other means. With the RangeRunner's ability to pull trailers and sleds, additional cargo capacity can be greatly increased with little effort.